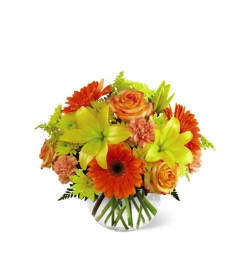 FTD® proudly presents the Autumn Harvest™ Bouquet by Vera Wang. 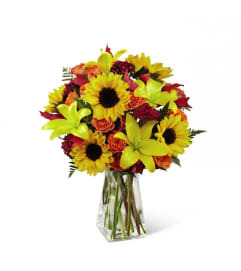 Full of fall floral style, this stunning harvest bouquet blooms with an alluring look that can only have been conceived by fashion icon Vera Wang. Orange bi-color Asiatic Lilies are set to capture your special recipient's every attention when arranged with rich red roses, burgundy snapdragons, purple button poms, and seeded eucalyptus. 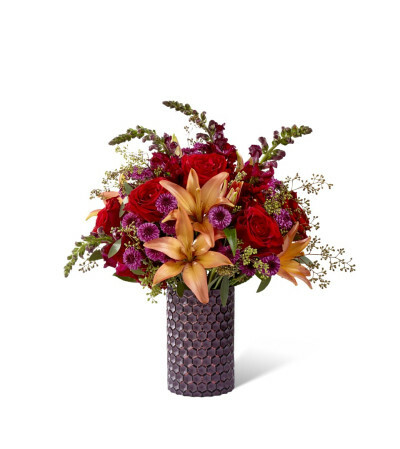 Presented in a modern deep purple ceramic vase embossed with an attractive honeycomb pattern throughout, this gorgeous fall flower bouquet is ready to help you express your warmest thank you, birthday, or Thanksgiving Day wishes in a simply unforgettable way.